Canadian Heather Bansley in action during her preliminary beach volleyball match against team Swiss at Rio Olympics August 10, 2016. When Sarah Pavan and Heather Bansley walked off the court this week after another preliminary-round victory in women's beach volleyball, the Canadian pair embraced in a warm, joyous hug. And why wouldn't they? In a two-set win over a talented Swiss team, the Olympic duo displayed an impressive, all-around game that sent a broader message to the top teams here that Canada is a squad to be reckoned with. "I think we did a lot of things well tonight," a jubilant Pavan said after the match. "When things are flowing the way they are right now, it feels very, very good." 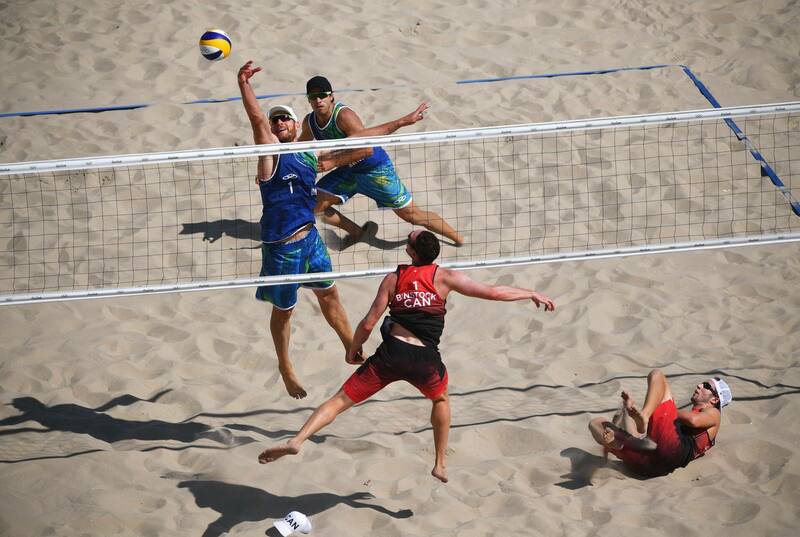 The fact that the two Canadians are playing in the spiritual home of the sport serves as a reminder of just how improbable their rise to beach-volleyball prominence is. It is not a pursuit that is, in any way, part of Canadian culture. Also, Pavan and Bansley were both indoor players who made the transition to sand. (Although Pavan still plays both). It is a conversion many players find impossible. Scott Davenport, the American coach of the pair, says beach volleyball is a completely different beast than its indoor cousin, a fact many people watching don't often grasp. In a conversation with The Globe and Mail, he explained some of the complicating factors involved in the beach game and why the Brazilians are so damn good at it. To the uninitiated, volleyball is volleyball. If you're good at the indoor game, you can be good on sand. "Absolutely not," Davenport says. In the indoor game, you have six players on the court. Often, each player has to be only good at a couple of things: blocking or attacking, for instance. Or maybe a player's primary role is defending, getting to balls to keep a point alive. Someone else's main job might be distributing the ball to attackers. "In beach, you have to be able to attack, set, serve, defend for the most part. You have to be far more multidimensional and do it in an environment that is constantly shifting. Oh yeah, you also have to do it in sand," Davenport says. There are many indoor players who have tried to play outdoor volleyball in the hopes of going to the Olympics but quickly discovered they didn't have the all-around skills necessary. Others realized that it was going to take a ton of hard work to learn the game and decided they didn't have the appetite for it. Bansley and Pavan are among those who did, and thrived doing it. More beach-volleyball teams blow up because of internal personality conflict than you might imagine. Relationship harmony is often a critical factor in a team's success. "Think of a six-person indoor team," Davenport says. "If two people don't like each other, it's not a big deal. There are four others [or more, if you include spares] you can turn to or hang out with. In beach, there are just the two of you. And if you're competing around the world on the professional circuit, you're with each other a lot, often rooming with one another, eating together. It can try the patience of the best of friends," he says. Imagine a marriage: The first year or so is the honeymoon period. After that, things begin to get real. The vagaries of life test whatever bond exists. It's no different in beach volleyball; a stretch of bad play can often turn players against one another, undermine their friendship and erode their togetherness on the court. There have been beach teams that have thrived despite the two players absolutely loathing one another, but they are rare. As with virtually all sports, beach volleyball has attracted bigger and stronger players. On the men's side, there are seven-footers now playing the game. Their looming presence has changed strategies at the net. Their male partner is usually a few inches over six feet at minimum. On the women's side, you are more apt to see a greater disparity in size. Pavan is 6-foot-5; Bansley is barely 5-foot-9. But they make it work. Bansley gets to shots a larger player might not get to. Still, she has springs in her muscular legs that allow her to drive the ball over the net with eye-popping ferocity. Pavan is a tenacious blocker; her ability to erect a two-handed wall at the net was a decisive factor in the win over the Swiss. She is one of the tallest players in the women's game, but also incredibly mobile for someone so big. Like many of the top players in the game today, Pavan has an incredible arm span, which helps to cover more territory. "For the women's game, taller players have made for more terminal attacks, meaning less rallies," Davenport says. "There are still much more [rallies] than in the men's game, but much less than in the past. For the men, I think the bigger players, coupled with a smaller court, seems to resemble the indoor volleyball rhythm more – quick scoring and/or unforced errors. There are fewer rallies than the traditional beach game [we have known in the past]." Bigger players are more noticeable and sometimes so are their tendencies. It is often easier to detect what players are going to do when, for instance, their elbow drops on a serve, or their torso or shoulder turns in a certain fashion. Video analysis has also changed the way teams strategize against one another. There may not be a bigger difference between the indoor and outdoor game than in the area of serving. Indoor is a controlled environment. Outdoor, winds can take a ball all over the place. The server often promotes this phenomenon by the manner in which she hits the ball. The float serve is delivered with a flat hand on the ball; this helps limit spin, which, in turn, allows the wind to carry the ball more freely. The result is a flight over the net that resembles a R.A. Dickey knuckleball. The ball used at the Olympics is more conducive to floating than the one used on the professional tour in North America. (It has something to do with the bladder inside). Until recently, most players took a running start before serving the ball. But four years ago, a different style of serve was introduced to the sport by 2012 gold medalist Julius Brink of Germany: the standing jump floater. It's performed by standing at the service line and throwing the ball up while bending down and then jumping up to smack the ball flat-handed as it begins to descend. Sounds simple but takes enormous co-ordination. This technique can often make the ball float over the net in a more erratic fashion than float serves initiated with a running start, making it more difficult to defend. The Brazilians are the undisputed masters of beach volleyball, which is understandable. In terms of importance, and the amount of resources invested in the sport, it is to Brazil what hockey is to Canada. And when you consider that, it makes what a team like Pavan and Bansley is doing even more remarkable. (They also get virtually no financial support from governing sports bodies in Canada, which is shameful). Consider that the Brazilians play beach volleyball from the time they are little. It is embedded in the way of life here. Little kids aspire to one day represent their country at the Olympics in the sport. This creates a massive feeder system of players that Canada and many other countries can't match. The Brazilians also practise differently, stealing a page out of soccer's training regime. They get players touching a ball as often as possible over the course of a practice. (Imagine a volleyball version of soccer's futsal, which is played on a tiny pitch, which promotes quick ball movement, innovation and lots of contact with the ball). They will set, dig and attack literally hundreds of balls over the course of a 90-minute session, the idea being that the more touches they get, the more comfortable they will be in the arena of battle. There is also a heavy emphasis on creativity (which begins at a young age) and skills training; in that regard, it resembles what Hockey Canada does through the teaching program it has developed for young players. "People who want to know why Brazil is so good just need to come down here and look around," Davenport says. "The beach volleyball nets are everywhere. You see little kids passing the ball around, loving it. There is just so much more competition down here, which breeds good players. It's amazing Canada has been able to produce two players like Sarah and Heather. It makes what they've accomplished so far that much more impressive." ‘It’s a Brazil thing’: In the spiritual home of beach volleyball, the host team tops Canada When Olympic tickets went on sale here three months ago, Brazilians rushed to buy seats at two events: soccer, of course, and beach volleyball.